Gatlin's Smoky Mountain Fun is your one-stop spot for family entertainment! 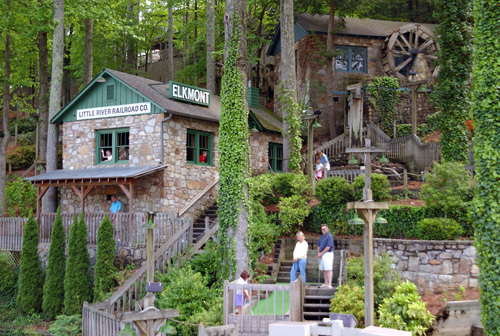 Nestled in the heart of downtown Gatlinburg, it has something for all ages. It offers a 3000 sq. ft. laser tag arena, indoor 9-hole blacklight golf, bumper cars, Gem Mining, two miniature golf courses, and more. Gatlin's Smoky Mountain Fun has it all! Located in the heart of Gatlinburg. 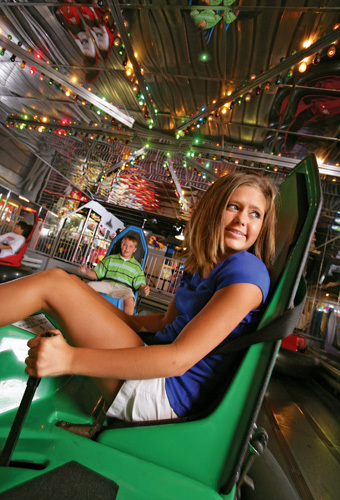 Gatlin's offers Miniature golf, laser tag, bumper cars, "Atomic Rush", and more. One low price for all activites. Gatlin's Smoky Mountain Fun (formerly Fort Fun) is your one-stop spot for family entertainment! Nestled right in the heart of downtown Gatlinburg, we offer something for all ages - whether it's taking on the family in our 3000 sq. ft. Laser Tag arena or enjoying a competitive round of Miniature Golf while learning about the history of the area! For your best value, try our "Do It All Activity Pass", which includes all of our activities at one low price. - The Old Town Square course offers a variety of trick shot holes designed for all ages. While playing, learn about the settlement of Gatlinburg with storyboards at every hole and take in the atmosphere of downtown from a beautifully landscaped vantage point. 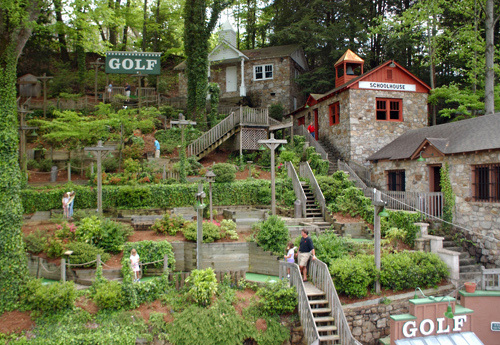 - The Mountain Trail course provides a more traditional putt-putt course for the avid golf enthusiasts. Prove you are a master of your short game with these challenging greens, and learn a little about the area before Gatlinburg was settled with storyboards at every hole. 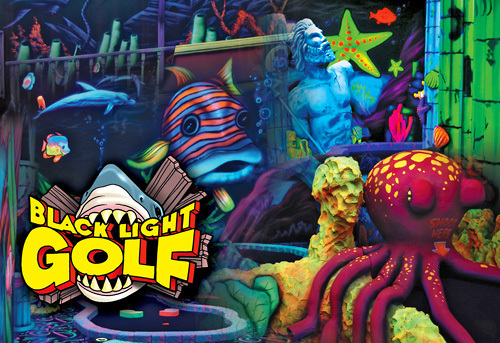 - Embark on a glow-in-the-dark putt-putt adventure under the sea, complete with mermaids, a pirate ship, and various aquatic obstacles to challenge all skill sets. Add a wackier dimension to your miniature golf game with our Mischief Spinners located throughout course. - Get psyched up for the best laser tag games in Gatlinburg! We feature a 3000 sq. ft. maze-like arena complete with interactive phasers and equipment. We recommend this activity for children over the age of 5 and at least 42 inches tall. - Dual lever steering controls allow you to go in any direction - or just sit and spin in circles! While there is a 44" height requirement, not having traditional gas and brake pedals allows most young kids to participate equally with the adults. - "Break the Vault" Lazer Maze Challenge is for the competitive visitor who wants to try their skill in a Mission Impossible setting. The object is to navigate the maze as quickly as possible without breaking a beam: jump, crawl, climb, and sliver your way through an obstacle course of brilliant green lasers to the top of the leaderboards! - Compete against up to 3 other players in this intense, live-action Simon Says competition. Race around the room racking up points every time you hit your color, but watch out! - hit your competitor's color and you'll receive a penalty! Warning: Highly Addictive! Gatlin's Smoky Mountain Fun is open at 10:00 am daily and closes between 9:00 pm and 12:00 am, depending on the season. What activities does Gatlin's Smoky Mountain Fun provide? In addition to indoor and outdoor mini golf, we provide multiple other exciting attractions including escape games, bumper cars, a video arcade, laser tag, and gem mining. Our new attraction, Atomic Rush, is sure to bring out your competitive side!